The more things you do, the more you can do. Or so it would seem for Shane Daly. A member of the Munster Academy, the UCC Finance student is currently on placement in the Corporate Tax Department at Ernst & Young in Dublin and you’d have thought he’d have little time for much else. However, in recent weeks Daly has played a prominent role for the Ireland Men’s 7s side who have been blazing a trail through the rugby variant. 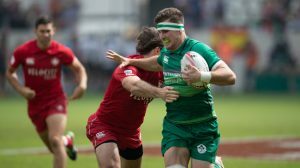 Having fallen short in their bid to qualify for the World Series in Hong Kong back in April, the Irish responded with an all-conquering display in the first leg of the 2018 Rugby Europe Grand Prix Series in Moscow a month later. It is the first step in a qualification process for the 2019 World Series with success in the Russian capital coming ahead of further legs in France, England and Poland. Yet it has been their impressive showings on the elite stage in recent weeks that has thrust Daly and his teammates into the spotlight. Ireland claimed a bronze medal in London with some heroic displays (not least a 21-19 win over hosts England at the buzzer), while their fine form continued in Paris as they topped their pool and earned further plaudits with their all-action displays. Not bad for an invitational side. Having largely been under the radar since the programme was relaunched in 2015, Ireland have climbed from the very depths of the European 7s circuit to face some of the best sides in the world and have acquitted themselves well in doing so. The likes of Rory O’Loughlin, Adam Byrne, Nick Timoney and Alex Wooton have all played their part but now it is Daly and his teammates who have been charged with taking Ireland to the next stage. A stage that was always going to be the highest hurdle to scale. “Teams like the Fijians are just incredible,” Daly gushes. “They’re at another level to any team that we would be used to. There’s no doubt that it is a big step, but we have to remind ourselves that even the World Series teams can’t compete with those guys when they’re on form. When we played them in Paris there were times when you just couldn’t help but admire some of the things that they were doing. Clinical is a word you could also use to describe the Cork Con man as he goes about his day to day business. 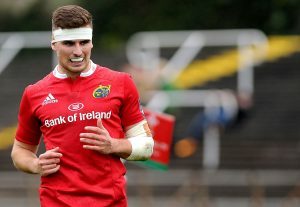 A recipient of the Rugby Players Ireland Player Development Bursary, Daly has been able to juggle his studies in Cork, Munster training in Limerick and Irish 7s duties in Dublin. Daly was also assisted by Marcus Horan, the Player Development Manager for Munster, when arranging for a Dublin based placement in January. 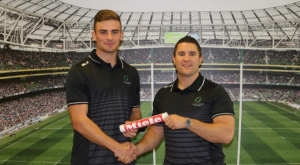 While Ernst & Young have benefitted from his application to work, Daly has also been able to push on with his 7s training owing to their flexibility ahead of an extremely busy period. Ireland return to France for the second leg of their qualifying series before heading to San Francisco and the Rugby World Cup 7s in San Francisco in late July. It’s probably not the summer he would have envisaged as a professional rugby player. Rugby was not always in his sights though. A former student of the Presentation Brothers College in Cork, Daly was always a keen sportsman and very adept at a number of disciplines. Lining out for Bishopstown GAA, a turn in the rebel red was more probable than possible. Perhaps this adaptability has made the transition into the 7s game that little bit easier? “I would say that transferring across to 7s from the XVs game is actually tougher,” Daly opines. “There’s a lot more to the game than what you would make out from TV; more shape and structure and it isn’t as off-the-cuff as people think. Defending is particularly tough, especially in figuring out your positioning. Often, someone will have 5-10 metres either side of you in which to beat you. That’s not comfortable at first. His ball-playing skills have certainly been demonstrated throughout his 7s career, including a monster 27m pass to release Ian Fitzpatrick in Hong Kong that picked up plenty of traction. Having developed through the XVs channels, Daly naturally has his sights on making the grade at Munster. However, given the aerobic nature of the sport, Daly has had to strike a fine balance to ensure that he remains in shape if Johann van Graan were to come calling. Indeed, that call first came in April when Ulster visited Thomond Park. Despite managing weight, time, studies and rest, Daly has also managed to to be successful in all that he has put his hand to. Whether his future career lies in the office or on the field, you can be sure that he is going to thrive.